See US stocks fluctuate in the trading session on Friday after the jobs report from the US economy, which fell short of expectations to indicate weakness in the US economy and increase the expectations to postpone raising interest rates during this year's data. Was the beginning of the American stock trading today largely negative in light of investors' appetite for sales operations affected by data jobs report which showed a set number of less-than-expected coupled with declining wage rates, reflecting the US economy negatively affected by a slowdown in the global economy and the deterioration of the emerging markets. Soon, however, US stocks to shrink back from its losses in the face of rising energy stocks and companies and health care, only to return the financial markets focus on expectations of higher interest which diminished significantly after the jobs report data today's prices. Former Federal Reserve Bank's decision to keep interest rates near zero levels was due to fears of the US economy affected by adverse developments in emerging markets and the decline in global growth as well as weak US inflation rates. Today's data came to confirm these fears decline in recruitment processes resulting from the decline in the performance of US companies affected by the decline in global demand and slowing growth in emerging economies, led by China. This is in addition to the increasing negative pressure on US inflation after witnessing the US wage rate index fell to zero levels during the month of September / September. Dow Jones industrial index reduced its losses, falling by 0.03% losing 4.41 points at the level of 16267.60 points, while the Standard & Poor's 500 Index fell 0.17% to lose 3.19 points, at the level of 1920.63 points. This has been the Nasdaq index of technology shares rose 0.02% to 1.10-point win at the level of 4628.19 points. NEW YORK (Reuters) - US stocks rose more than one percent at the close on Friday and after compensated the sharp losses suffered by Sabak- at the time of the rise of the strong support for the shares of energy and raw materials with receding fears about the economy. 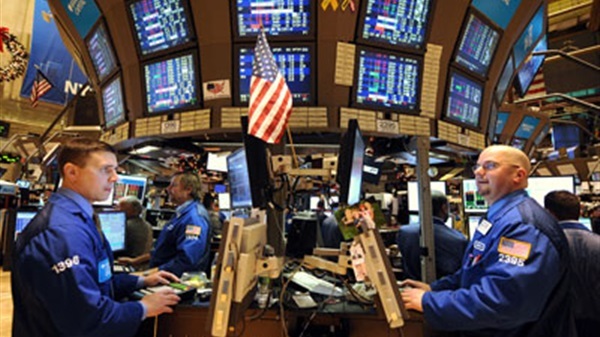 The index rose Dow Jones industrial average 200.36 points, equivalent to 1.23 percent to 16472.37 points. The index rose Standard & Poor's 500 increased by 27.53 points or 1.43 percent to hit 1951.35 points. The Nasdaq Composite Index 80.69 points or 1.74 percent to 4707.78 points.